Returning to Huế again in December, the weather was a lot more cooperative and even chilly after weeks of non-stop rain. I caught a lucky break in between the rains for a few dry and sunny days. Much of the tourist crowds I saw in the summer had largely left, leaving the historical city to its own usual inhabitants. As my second visit to Vietnam, I became more acclimated than the first. Instead of simply being overwhelmed the myriad of new sensory stimuli, I was able to get a chance to process and analyze what I have been seeing, which was helpful to focus on my research questions about the global rhetoric of ornamentation and surfaces, ritual spaces in a mortuary context, and imperial workshops. Since my project is still ongoing I shall write about these topics on another day. In this entry, I would like to ruminate on the issues of Chinese text in contemporary Vietnam. Historically written Chinese (as classical Chinese, chữ nho or chữ Hán) was used as formally by the elites and at the court during both Chinese dominated eras and imperial dynasties such as Ly (1009-1225) and Nguyễn (1802-1954). Its usage generally died out during the early part of the twentieth century, as the French colonial government imposed the Roman-alphabet-based chữ quốc ngữ (“national language script”) system. A modified writing system chữ nôm had existed since at least the Ly dynasty (1009-1225), using the Chinese characters or forms of Chinese characters to express Vietnamese words. Today, most Vietnamese cannot read or understand written Chinese. Yet in my travels in Vietnam, I encountered many signs in Chinese. These signs were old and new, large and small, and in classical and colloquial Chinese. They were found on the façades of buildings, on pillars inside and out of structures, flanking and surrounding altars, prominently displayed in cars or hanging on the sides of bikes. They were handwritten, printed in raised gold papers on red backgrounds, incised onto large wooden plaques darken by time and incense smoke, carved and painted in gold and mounted on large vertical plaques, and pieced together by broken ceramic shards from around the world. 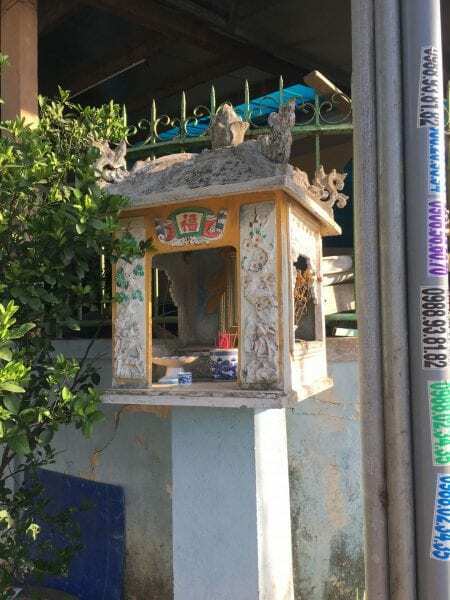 A street shrine in Huế, August 2018. Interior of a garden house, Huế. August 2018. Near the citadel, Huế. August 2018. One characteristic common to all was that a vast majority of them are visible in public or semi-public spaces. They faced outward on the doorways and windows, onto streets and courtyards. But if most people who would interact and see them cannot make sense of them, what is their purpose? For that, it may be helpful to examine another category of signs ubiquitous in the lives of everyday Vietnamese but equally incomprehensible to a majority: ornamental rebuses. 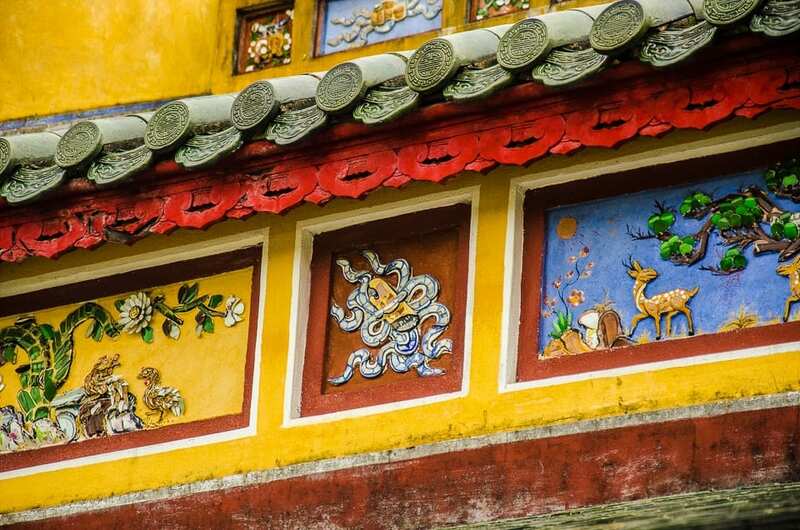 In Hue and elsewhere in Vietnam, ornamental rebuses could be found in many of the same places as the Chinese characters. Rebuses are basically “pictorial puns,” and the nature of the Chinese language is such that many words and characters share the same sounds and tones allow plenty of opportunities for “skillful wordplay and punning,” to borrow the words from the former curator of the Asian Art Museum of San Francisco Terese Tse Bartholomew’s study on the subject. One place where this could be found is on the façade of the imperial palace. Since much of the imperial palace was damaged in the last century gradually by time and widely by events like the Vietnam War (1955-1975), my interpretation of the ornamentation relies on the presumed faithfulness of the restorations to the nineteenth-century original. In the detail below, we see two ornamental rebuses in ceramic mosaic in frames separated by a ribbon-wrapped scroll. A typical way of presenting these motifs, the scroll is one of the symbols of the Four Scholarly Pursuits standing in for culture. The rebus on the left is a rooter and a hen resting under a chrysanthemum. In Chinese, “chicken” (ji 雞) is homophonic with “auspicious” (ji 吉). Furthermore, the inclusion of a hen and perhaps small chicks suggest the simple joy of a complete family, a motif has its origin at least as early as the Southern Song. Chrysanthemum (ju 菊) is a symbol of longevity, but it is also homophonic with “dwelling” (ju 居). This rebus thus suggests at least two readings: 1. Wishing to dwell auspiciously as a family, or 2. Wishing for an auspicious and longevous family. The rebus to the right works similarly in terms of mechanics, where the animal provides the homophone – “deer” (lu 鹿) is “wishing for official status” (lu 祿), and the vegetation, the pine tree, are symbolically standing in for longevity. Put together the message is wishing for official status while obtaining longevity. In personal communication with my teammate Phi, who is a native Vietnamese speaker, it seemed that some of the homophonic messages carried through from Chinese. For example, one of the variants for “deer” is the Sino-Vietnamese word “lộc,” which carries the meaning “personal gains” like in Chinese. 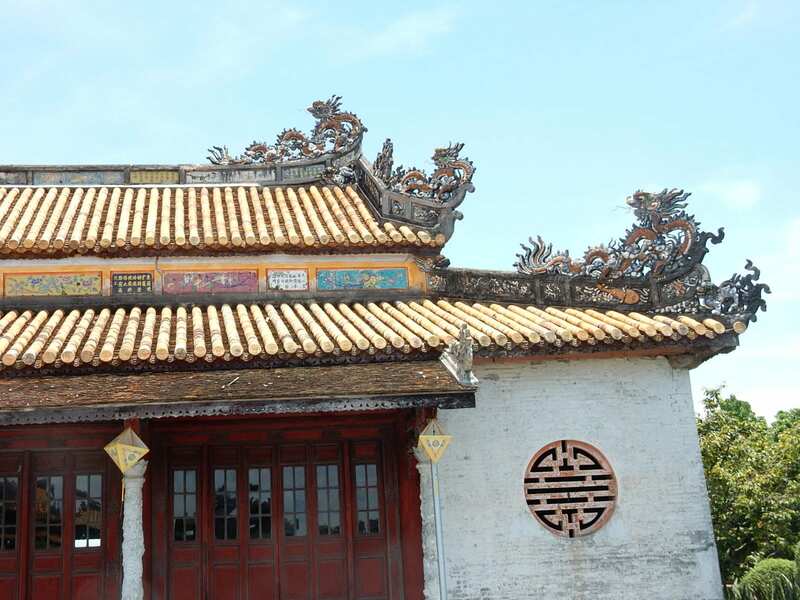 Others homophonic rebuses such as “chicken” for “auspiciousness” are less clear, or at least they are not part of the Vietnamese colloquial usage today. The mechanism of a rebus relies on making the two-step connection between the sign (idea) into signifier (text) and then into pictorial sign (image), that if the signifier becomes the variable (i.e. 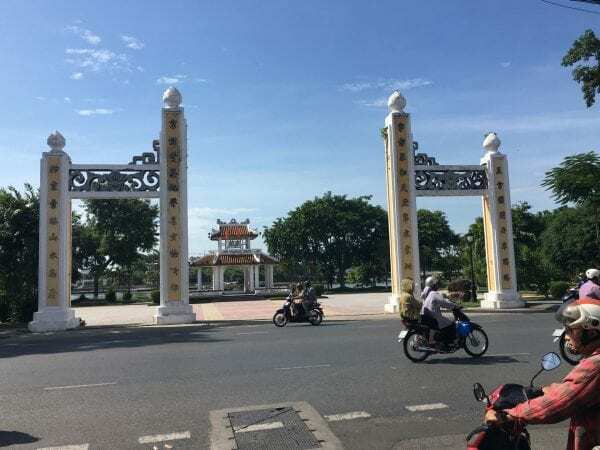 Vietnamese rather than Chinese) then the chain would break, leaving the connection between the image and the text is a purely symbolic one in the Piercian sense – linking two completely unrelated phenomena through given historical or incidental conditions. Nonetheless, even though the same rebuses are still equally ubiquitous in China where they could be read and understood, they are often not. 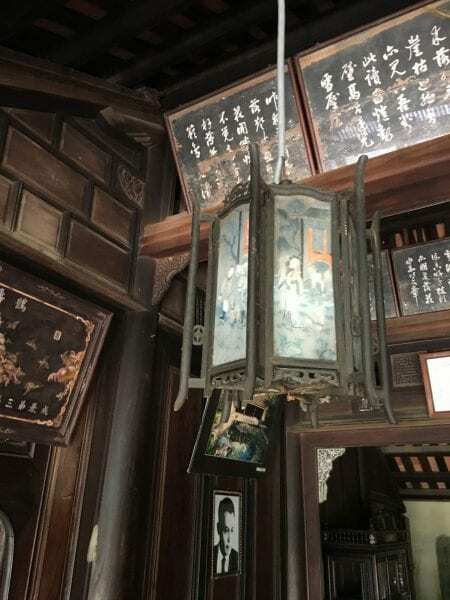 Instead, their mere presence would signal a particular type of social status of the owner and the creation of a particular auspicious environment. In an interview on the phenomenon of Chinglish signs in China, where strange and grammatically incorrect English were used to create often unintentionally humorous translations of Chinese on publically visible signages, the Sinologist Victor Mair has observed that since English has become an international language, Chinese entrepreneurs were obliged to put it everywhere without any concern whether they were “right” or not. In another earlier discussion on Chinglish, the author Oliver Radtke further elaborates that the real power of the Romanized alphabet system is its use as a visual sign rather than the meaning of its content. He notes that Hanyu pinyin, the system of Romanize Chinese characters invented in the 1950s in the People’s Republic of China and now taught in every elementary school across China and introductory Chinese language courses around the world, is also used in the same way by Chinese entrepreneurs. Often without tonal accents, spaces between each character, and appeared alongside Chinese characters they are transcribing, these pinyin letters are essentially useless. They are, as noted by both Radtke and Mair, “decoration,”  aimed at a non-alphabet-reading domestic audience. Their inclusion on advertisements signal to their intended domestic audience that the product being sold is modern, Western, and sophisticated. What makes Chinese calligraphy so attractive to a non-Chinese reader is the aesthetic quality of it. Abstract and dynamic, an untutored eye could discover many of the same qualities valued by seasoned calligraphers such as rhythm and composition. There were plenty of precedents to demonstrate other cultures’ attraction to Chinese text’s formal qualities such as the Tangut language or Chữ Nôm. As works like Book of the Sky by the contemporary Chinese artist Xu Bing suggest, the visual power of written Chinese to broadcast authority and knowledge continues to be with us today. Is there a way to combine the aesthetic quality of Chinese text and calligraphy without adhering to written Chinese? Examples like this courtyard screen offer an alternative. 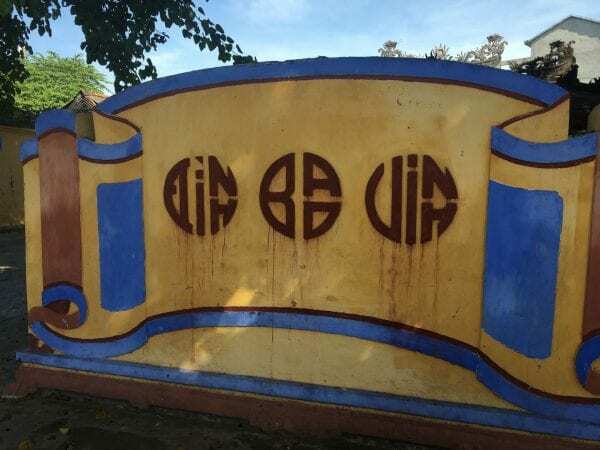 The three Vietnamese words in chữ quốc ngữ are graphically contorted to form three circles that deployed a similar graphic strategy as the stylized Chinese character for longevity shou 壽 in the final image of a round window lattice from the Huế imperial city. Huế imperial city, August 2018. Emperor Khải Định abolished the Chinese writing system for the Nguyen dynasty in 1918. On the French colonial government’s spread of chữ quốc ngữ, see Benedict Anderson, Imagined Communities: Reflections on the Origin and Spread of Nationalism (Verso, 1991), 127-8. On chữ nôm, see Laurence C. Thompson, A Vietnamese Reference Grammar (University of Hawai’i Press, 1965), 53. The oldest surviving chữ nôm inscription can be found on a stele dated to 1209 at the Bảo Ân temple. See John DeFrancis, Colonialism and Language Policy in Viet Nam (Mouton, 1977), 23. Terese Tse Bartholomew, Hidden Meanings in Chinese Art (Asian Art Museum of San Francisco, 2006), 17. Andrea Teufel, a conservator we met working for the Hue Monuments Conservation Centre told us during a visit in August of 2018 that the restorations on the imperial palace façade were researched and historically accurate. Email communication with Phi Nguyễn on January 3, 2019. Oliver Lutz Radtke, “A Dialogue with Victor H. Mair. Professor of Chinese Language and Literature at the University of Pennsylvania,” in More Chinglish: Speaking in Tongues (Gibbs Smith, Publisher, 2009), 10. Oliver Lutz Radtke, Chinglish: Found in Translation (Gibbs Smith, Publisher, 2007), 11. For Shang bronzes, see Robert Bagley, “Meaning and Explanation” in Roderick Whitfield, ed., The Problem of Meaning in Early Chinese Ritual Bronzes, Colloquies on Art & Archaeology in Asia, no. 15 (London: Percival David Foundation of Chinese Art, 1993), 53. Oleg Grabar, The Mediation of Ornament (Princeton University Press, 1992), 107. Unless otherwise noted, all images are the author’s.